Book Reviews Editor Debbie Hagan interviews Susan Kushner Resnick author of You Saved Me, Too: What a Holocaust Survivor Taught Me About Living, Dying, Loving, Fighting and Swearing in Yiddish (Globe Pequot/skirt!, 2012). Resnick has been a writer and journalist for twenty-eight years. Her first book, Sleepless Days: One Woman’s Journey Through Postpartum Depression (St. Martin’s Press, 2001) was the first memoir of PPD by an American author. Her second book, Goodbye Wifes and Daughters (University of Nebraska Press, 2010/11), earned her the Best Woman Writer 2011 prize from the High Plains Book Awards. She was a finalist for the Montana Book Award and the Western Writers of America Contemporary Nonfiction Award. She has been published in the New York Times magazine, The Writer Magazine, Brain, Child magazine, the Boston Globe, Parents, Utne Reader, and Montana Quarterly, among others. She was nominated for a Pushcart Prize in 2001, and her work was listed as a notable essay in The Best American Essays 1999. 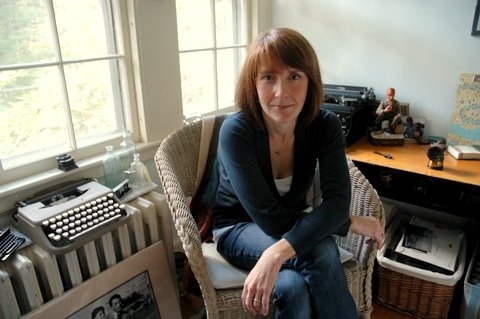 She teaches creative nonfiction at Brown University. Resnick’s book You Saved Me, Too, which will be released in paperback in November, follows the author’s remarkable fourteen-year friendship with elderly Holocaust survivor Aron Lieb. They meet weekly for coffee, and their relationship turns into something profoundly different from what they ever could have imagined. They’re soul mates, offering to each other love, trust, and compassion. DH: As I understand it, you were a reporter for the Providence Journal when you met Aron Lieb. You must have been scouting stories and saw story potential in this survivor of Auschwitz, Dachau, and the other death camps. How did your relationship grow from potential “source” to something more. SKR: I met Aron at a Jewish Community Center, so he was always a friend first, but I quickly started to interview him in detail because I thought he would also make a good book subject. I thought I would write a book about how his life intersected with that of his girlfriend, who was a Jew from the former Soviet Union who’d never practiced Judaism due to anti-Semitism. I wrote a book proposal based on this idea, but my agent at the time couldn’t sell it. Most of the rejections claimed that no one wanted to read about the Holocaust. I put my steno pads and tiny cassettes with Aron’s voice on them in my attic. But I always knew I’d write a book about him someday. I just had to wait to figure out what that book was, which didn’t happen until the day he died. For most of our friendship, I told myself, “You can’t know what the story is because the end hasn’t happened yet.” Shortly after I had my story, I met my agent through a personal connection. She asked to see a proposal. DH: You Saved Me, Too is an unexpected love story that’s funny and poignant. The strong voice lifts it out of tragedy and takes it into an inspirational place. How did you use the voice to set the tone and create the desired emotion? SKR: I didn’t deliberately choose the voice – it’s how I sound when I speak in my head. I decided to tell the story of our relationship using that natural voice when I began speaking to Aron in my mind while he was dying. It’s how I would have a conversation with him. DH: This book deals with a lot of social issues, among them posttraumatic stress disorder, dysfunctions in the health and elderly care systems, and the difficulties in returning to a normal life after severe trauma. How were you able to juggle so many topics and yet keep the story simple and cohesive? SKR: I guess I was just telling the story the way it happened, which was full of all of those social issues. Each leads to the next, so it’s really all one issue. My biggest juggling challenge was figuring out how to move around in time within a sequential frame. The story starts as I drive to Aron’s deathbed and ends at his funeral, with his entire life, all the social issues that arose, and our long friendship squeezed into that frame. DH: You helped Lieb through his depression and raised money so he could live in an elderly care facility. As the title suggests, he saved you too in recovering from postpartum depression. How were you able to address your issues and yet not fall into the common writer’s trap of being self-absorbed? SKR: Probably because I’d already written a memoir on postpartum depression, so I’d done all my navel-gazing there! And though I met Aron while I was recovering from PPD and he provided stability and distraction, that wasn’t actually how he saved me. In fact, it wasn’t one event at all—it was a lot of little things that made me a better person and helped me survive the loneliness of being a suburban mom. DH: The main characters—yourself and Lieb—are very likeable, which are key to creating a memorable narrative. Do you have specific techniques you use to build strong, empathetic characters? SKR: I guess just showing all sides of the characters. Aron was cranky and charming, smart and neurotic, so there were a lot of dimensions to play with. I think it helped that I’d taken notes on him for fourteen years. It’s easier to use direct quotes in a person’s true voice than to recreate conversations from memory. And using details—the cherry Lifesavers, the hoarded napkins—also helps bring a character to life. DH: Can you talk a little about this book’s structure. It’s written as a letter addressed to Lieb, as if you’re retelling the story to him with emotional insights and a more experienced perspective. Why did you set it up this way? SKR: I wanted it to read as if I were sitting by his bedside and telling him the story of our life together, plus some things about myself that I’d never revealed to him. The tricky part was adding general background and writing about things that Aron already knew. Then I remembered that by age ninety-one, he was sometimes confused about his own life. So I gave myself permission to remind him of facts he’d told me. DH: What surprised you the most in writing this story? SKR: How easily the writing came after fourteen years of trying to figure out what I wanted to say about our relationship. I always knew that there was a story behind this amazing stranger coming into my life, but I couldn’t find it out until the day he died. The long wait taught me great patience and the value of putting writing projects on the counter until they’re ripe. DH: How did Lieb feel about the book and did you read portions of it to him? DH: Any question that you wished you had asked Lieb but didn’t? SKR: I wish I’d asked whether he would have been honored or offended if I’d gotten his Auschwitz number tattooed on my arm. The general public was outraged by the idea, so I had it engraved on a tiny bracelet that I wear every day. Debbie Hagan is a writer, editor, and book reviews editor for Brevity online literary magazine. She has an MFA from Goucher College, and her work has appeared in various media, including Boston Globe Magazine. Who knew, just ID’ed your name…Do you know Pete Hamill’s work? Great interview , the sadness part of it is the holocaust . However the story began with a friendly sentiment that’s marked me reflected for a moment , than the characteristics of it changed to love . As a matter fact , I am thrill . It is a beautiful history .